A special telephone number - 058 888 8888 - has raised Dh4.5 million ($1.23 million) at the UAE telecom company du's special numbers auction. 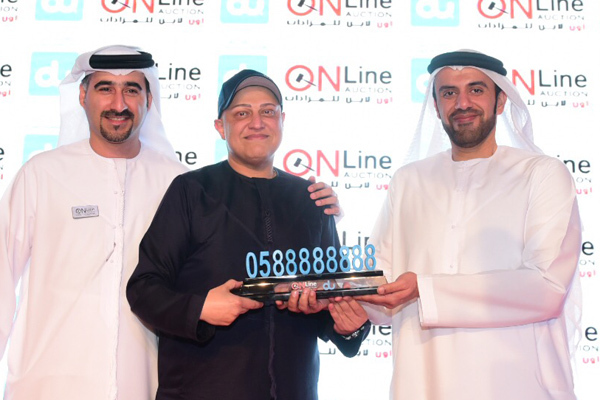 It was the first exclusive 058 number launched in the UAE. The auction, where 50 numbers were sold, raised a total of Dh7.4 million ($2.01 million), said a statement. For the first time, du Smart Platinum Plan was also on auction. In a tie-up with Etihad Airways, du ensures that customers have a seamless, cross-border connectivity experience, and an opportunity to immediately attain Etihad Guest Gold tier status, for a premium travel experience with the UAE 5-star airline, said the statement. Ahmed Aburahima, executive vice president, government relations, du, said: “Our customers always come first, and we have long since recognised that different customers have equally different requirements. We always look forward to delivering on exclusivity for our valued customers, and our auction enables us to offer them incredible plans and elite numbers, for seamless connectivity and the ultimate customer satisfaction."